The thermostats are big business these days, especially the smart ones. Not only they are the future of smart homes but they also redefine the interaction between people and their home. The smart thermostats have evolved over time in ways that are not limited to human anticipation any more. In fact, it’s still continuing to evolve as part of building home automation market. Looking back at their successful history, it won’t be completely wrong to say that smart thermostats have become the gateway to smart homes. And it offers a decent value proposition for homeowners looking for smart ways to control the heating and cooling system of their homes. When it comes to smart thermostats, one of the leading names that’s been dominating the smart home market for years is Nest Labs. The company’s flagship product and its first offering was the Nest Learning Thermostat which was launched in 2011. It was designed to learn and anticipate human needs, so humans wouldn’t have to. It was one of the first examples of Internet of Things to reach a large consumer market. However, Nest is not the only game in town. Honeywell was the leading manufacturer of home thermostats at the time of Nest’s founding. It has been in the thermostat game for a long time. Let’s see how they stand against each other. Nest Labs is a California-based home automation specialist company that designs and manufactures smart home products such as thermostats, smoke detectors, and home security systems. The company was founded by two former Apple engineers Tony Fadell and Matt Rogers in 2010 with the prime focus on self-learning thermostats. It started off with programmable thermostats and smoke/carbon detectors. The company’s mission centers on the idea of creating a home that takes care of the people inside it and the world around it. As a result, Nest released its first self learning thermostat – the Nest Learning Thermostat – in 2011 and it was revolutionary. In 2014, Google acquired Nest Labs in the second biggest deal in the history of Google. Honeywell International Inc. is a multinational conglomerate company based out of New Jersey. The company manufactures a wide variety of consumer and commercial products with business interests in aerospace, engineering services, automotive products, and industrial control systems. The company was founded by Mark C. Honeywell in 1906 as a result of the merger between AlliedSignal and Honeywell Inc., but the name Honeywell still stands because of its brand recognition and successful history. Throughout its rich 110-year history of innovation and excellence, Honeywell was revolutionized the field of automatic control. Honeywell recognized itself as the leading maker of home thermostats at the time of Nest’s founding and is still a pioneer in automation control. – Nest always prides itself on its minimalist design when it comes to aesthetics. The round gleaming dial of the new Nest looks stunning and the stainless steel ring around the bezel is a classic touch. It goes without saying that Nest boasts a stylish design compared to the traditional looks of the Honeywell Wi-Fi Smart thermostat. The round faceplate of the Honeywell with the glossy black display is not that bad either – it adds a subtle touch to a home décor. – Both the Nest self learning thermostats and Honeywell Wi-Fi smart thermostats are good looking devices with plenty of smart features such as temperature control, scheduling, voice support, etc. However, the one area where Nest excels is automation. While both the smart devices use geofencing – a proximity control technology to determine whether you’re home or away – only Nest has its own occupancy sensor to detect occupancy and it learns temperature preferences. 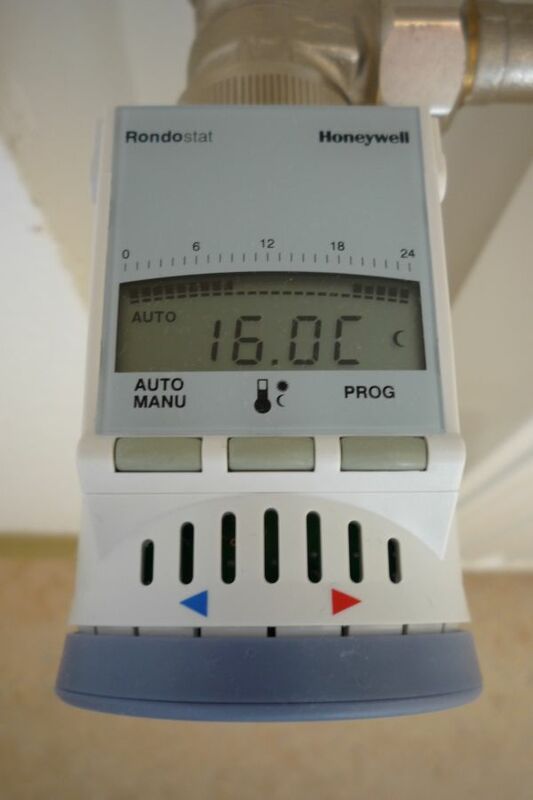 Honeywell thermostats, on the other hand, require a little bit of programming like setting temperature changes. – While both the smart thermostats perform equally on various grounds such as automation, smart features, energy saving, value for money, and so on, Honeywell has an edge over Nest when it comes to temperature control keeping the home’s temperature within the desired limit at all times. 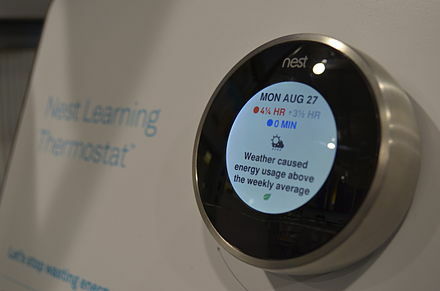 However, Honeywell isn’t a self-learning thermostat like the Nest, so it needs a schedule to follow. Additionally, Honeywell sends email alerts if your device loses connection or if the temperature inside the home exceeds or falls below the defined limits. Nest doesn’t provide email alerts of any kind. – Honeywell lets you feel connected and in control at home with all controls on the screen itself allowing you to do almost anything right on the screen itself. With Nest, on the other hand, you’ll have to go to the web app or the mobile app to adjust your Nest settings. Plus the “Hold” feature on the Honeywell is a big plus, whereas Nest simply lacks a simple hold. Additionally, Honeywell’s vacation mode saves a great deal of cost and energy while you’re away. There’s no such vacation mode in Nest. While both are the two big names in the smart home market serving customers worldwide with their products and services, Honeywell has been in the thermostat game for a really long time which in fact proves its stronghold in the smart thermostat segment. However, Nest is not far behind either offering much of the same automation functionality with its wide range of self-learning thermostats. Well, if you’re looking for better control at home and ease of use without worrying about the aesthetics of the device, Honeywell is a perfect match for you. And if you want an energy saver with plenty of smart features to go with, Nest is your best bet. Sagar Khillar. "Difference Between Nest and Honeywell." DifferenceBetween.net. 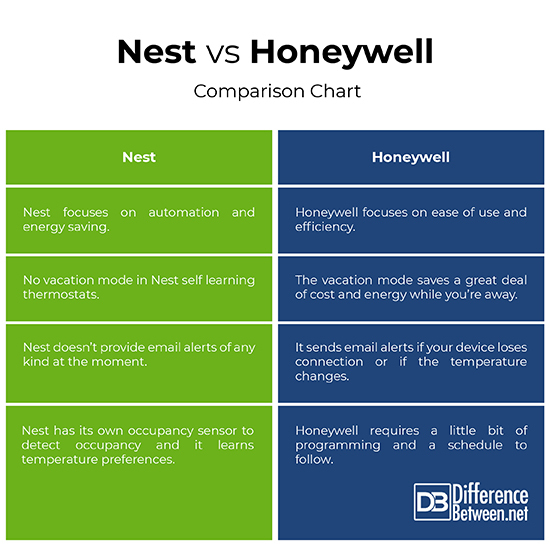 November 12, 2018 < http://www.differencebetween.net/technology/difference-between-nest-and-honeywell/ >.